Leggero offers outstanding Italian food in the heart of London, with locations in Soho, Mercato Metropolitano, and Camden Town Stables! Leggero are very proud to offer gluten-free menus and specialise in preparing meals that impress. They ensure that their gluten-free products are even better than the traditional recipes! At Leggero, the aim is to give everybody the freedom to enjoy beautiful recipes regardless of dietary requirements. With plenty of vegan and vegetarian options, their menus cater for everybody! Leggero has teamed up with Carbon Free Dining; the United Nations-backed Restaurant initiative. Hungry Oven has chosen to become a Carbon Free Dining Certified restaurant and demonstrate their love for the environment by partnering with the programme. 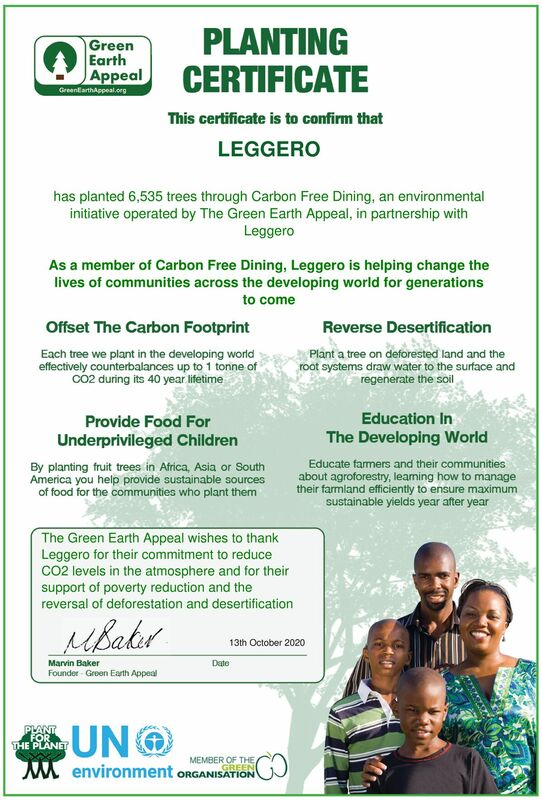 As a Carbon Free Dining Certified restaurant, Leggero plants hundreds of trees each month, effectively offsetting the Carbon Footprint of the meals they serve. This is done by simply giving diners the opportunity of planting a single tree with each bill for an optional 99p.